Jean-Baptiste Sabatier-Blot was a contemporary of the more famed artist, Daguerre, the subject of the above daguerreotype. Not much is known about Sabatier-Blot, but I was able to find some interesting facts about Daguerre and the daguerreotype. When I was looking for an image to show for this post, I wondered why there were so few to choose from. 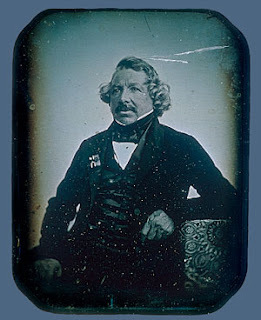 According to the Met Museum website, "Neither Daguerre's microscopic nor his telescopic daguerreotypes survive, for on March 8, 1839, the Diorama—and with it Daguerre's laboratory—burned to the ground, destroying the inventor's written records and the bulk of his early experimental works. In fact, fewer than twenty-five securely attributed photographs by Daguerre survive—a mere handful of still lifes, Parisian views, and portraits from the dawn of photography." However, what does survive shows an insight into how life was "back in the day" and why I find the subject of Daguerre in a photograph to be so interesting. One reads so much about the man attributed to the advent of photography and here we can finally look at him in the medium he is so well known for. Had it been a painted portrait I don't think this image would've had so much impact, dust, scratches and all.